It’s our new format, feedback needed. Good viewing! This entry was posted in Uncategorized on February 26, 2016 by hotzog. inSynch unfolds on Steam now! This entry was posted in Uncategorized on September 30, 2015 by hotzog. As we were listening to Bioshock Infinite’s “Will the Circle Be Unbroken” cover, we had a YouTube recommendation for another video game song. We started building a little playlist, and we’ve found enough to give it a real purpose. The rules are quite simple: only songs – sung lyrics – composed for a video game. Many songs were created for movies, animated or live action, from famous Disney songs to aptly named ‘musicals’. Not long after a lot of them became popular, then classics. Video game music isn’t new, but it was only in 2010 that ‘Baba Yetu’ – main theme of 2005 Civilization IV – got nominated, and won the “Best Instrumental Arrangement Accompanying Vocalist(s)” category. Before that, the Spike Video Game Awards (VGA) and VGX had a several music categories, from 2003 to 2013. It is a mesmerizing soundtrack, the vocalists are fantastic, and Christopher Tin’s music composition gives epic and hopeful dimensions to the track. The lyrics are a Swahili translation of the Lord’s Prayer. It is far more common to use song for any kind of track in English, here, look at > this < : in every “10 SONGS” article, you’ll find less than 3 actual songs, meaning, sung lyrics. In French, we’re sliding towards this too, people gets less and less angry if you say ‘DAMN THIS MUSIC IS MY JAM’ when it’s actually a song, and so on. But I’ll never forget the difference thanks to my highschool music teacher’s stare. We’ll continue to add songs from your suggestions! Tweet us @themgames with the link and leave the rest to us! C’est parti d’une énième écoute de la cover “Will the Circle Be Unbroken” dans Bioshock Infinite. Puis d’une recommandation YouTube avisée. Et ça s’est fini en playlist et maintenant, on continue en curation ! Les règles sont simples, seulement des chansons, avec des paroles, composées pour un jeu vidéo. Beaucoup de chansons ont été composées pour le cinéma, que ça soit en animation ou en comédies musicales, et sont devenus des succès. Or il a fallu attendre 2010 pour que ‘Baba Yetu’, le thème principal de Civilization IV sorti en 2005 soit nominé aux Grammy Awards et gagne cette compétition dans la catégorie “Meilleure composition musicale accompagnant un choeur” (“Best Instrumental Arrangement Accompanying Vocalist(s)”, la catégorie va encore changer de nom en 2015). La composition de Christopher Tin ajoute ce qu’il faut de grandiose aux choeurs, dont les paroles sont une traduction Swahili de la prière Pater Noster. Lors de nos recherches nous avons remarqué que les anglophones utilisent beaucoup ‘song’ quand bien même le morceau est entièrement musical. Nous, francophones, on se fait reprendre en 5° au collège par le prof de musique qui t’enlève deux points pour avoir écrit ‘musique’ au lieu de ‘chanson’. Pas juste. La playlist va s’étendre et s’affiner, et ce grâce à vos suggestions ! Envoyez-nous vos chansons de jeu sur notre twitter @themgames, on se charge du reste ! This entry was posted in Uncategorized on August 7, 2015 by hotzog. Oscar Barda (@Osskx) fait petit topo sur l’intelligence intuitive, l’intelligence déductive et comment les jeux vous apprennent des choses. Et n’oubliez pas de venir nous dire ce que vous en pensez sur les réseaux sociaux ! This entry was posted in Uncategorized on June 16, 2015 by hotzog. Aujourd’hui on discute d’un outil que nous sommes en train de créer : la carte du monde du jeu vidéo. Alors rendez-vous dans les commentaires, sur Youtube ou sur les réseaux sociaux pour nous filer un coup de main ! This entry was posted in Uncategorized on March 29, 2015 by hotzog. Vous trouverez ici l’article fondateur du MDA. This entry was posted in Uncategorized on March 21, 2015 by hotzog. Cette semaine on est partis pour un épisode très technique sur la transitivité dans le gameplay, un outil essentiel du design ! This entry was posted in Uncategorized on February 27, 2015 by hotzog. Nous démarrons une nouvelle série de vidéos youtube : les petits essais dessinés ! This entry was posted in Uncategorized on February 21, 2015 by hotzog. Here it comes, a new article from Them Games! 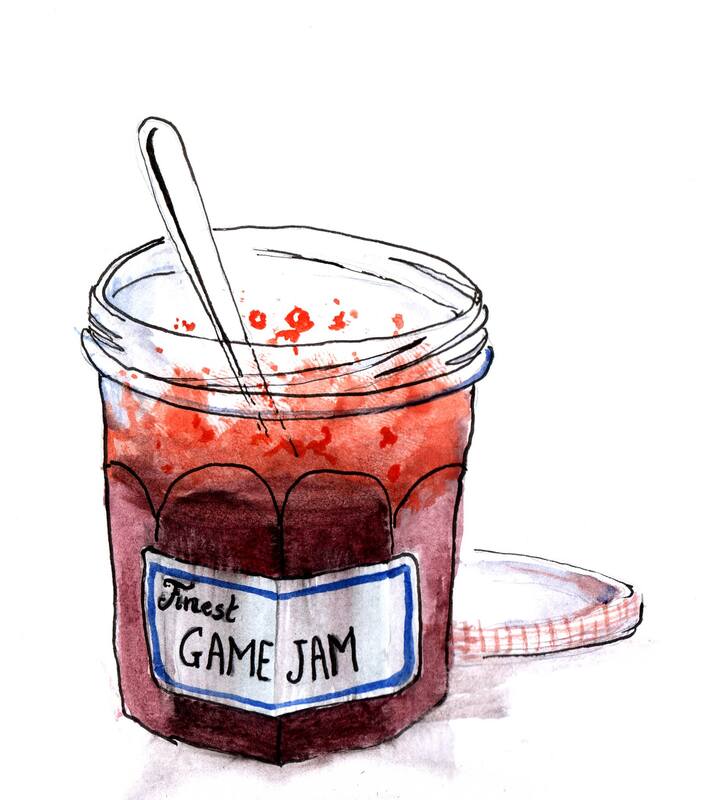 So we went looking over the internet but could not, for the life of us, find a list of video games made during game jams – a sort of compendium of success stories if you will! Of course, this list is far from complete, and will be updated as jams and time pass. Drop us some names in the comments or by email, we’ll be pleased to add them! Darknet (Ciess) Oculus/Indiecade VR Jam Oculus + ? This entry was posted in Uncategorized on February 3, 2015 by hotzog.